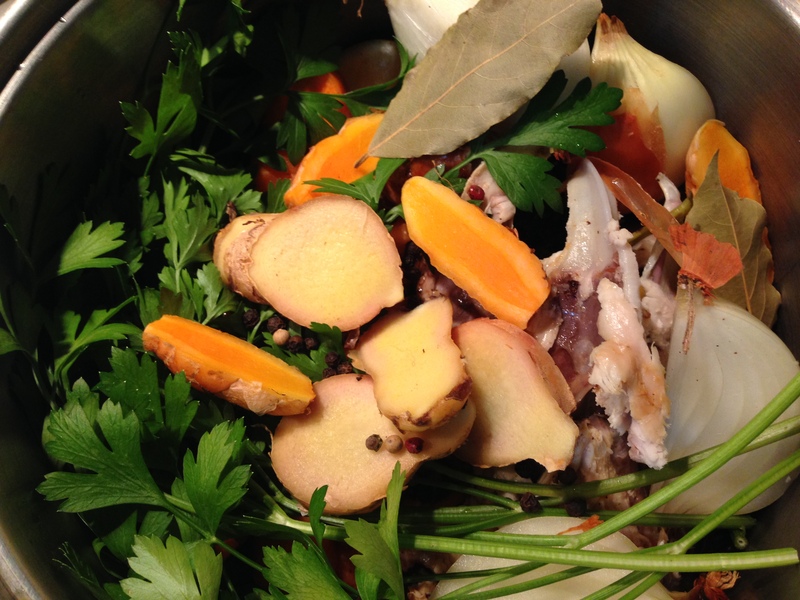 When you’ve roasted a chicken (see my easy roast chicken recipe here) the scrapings from the pan, and the frame and bones of that chicken, will give you the basis for a wonderful stock. 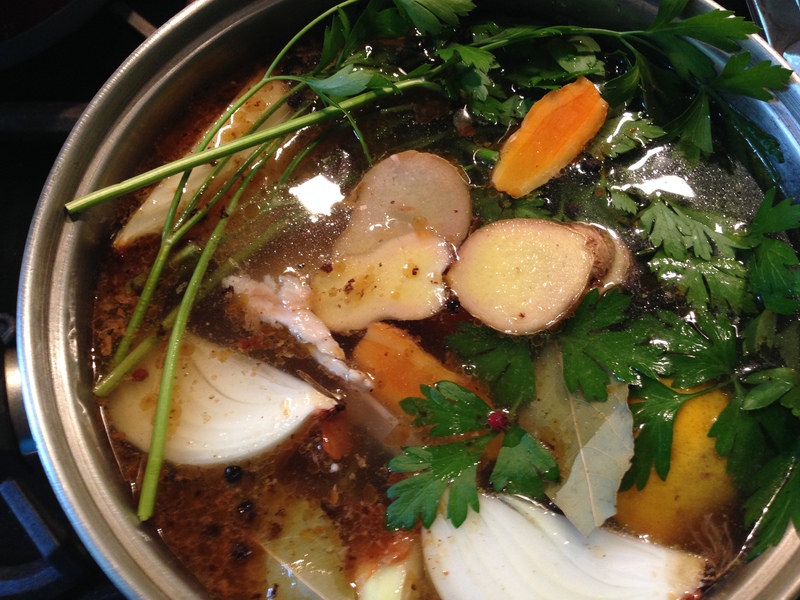 Stock, or bone broth as it is also known, has many health benefits. Think of it as healing goodness in a bowl!The bones, cartilage, skin and remnants of meat on the chicken frame are cooked over low heat for many hours with scraps of vegetables and herbs, producing a broth that is full of amino acids and minerals – such as calcium, magnesium, sulphur, silica and potassium – which are nourishing and replenishing for our bodies. The stock can be used in your soups, stir-fries, curries, pasta and rice dishes, casseroles and even as a warming drink. If you’re in a hurry, then you can cook this for four hours, but if you have the time try to cook for a minimum of twelve hours. The pan in which you roasted your chicken (if possible), left-over bones and frame (carcass) of a roast chicken, a tablespoon of vinegar, 2 dried bay leaves, 2 ribs of celery, 2 carrots, 1 onion, a large bunch of parsley, 6 whole peppercorns, and any other scraps of vegetable or herb that you have on hand and would like to throw in the pot. Tip: I have a large ziplock bag in my freezer. When I have the tail ends of carrots, celery, herbs, leeks, shallots and so on at the end of a meal preparation, I put them in the bag and return to the freezer for my stock-making days. In a large pot (you could also use a slow cooker) with a close fitting lid, put the left-over chicken frame and any extra chicken bones (such as the drumsticks) from your meal. 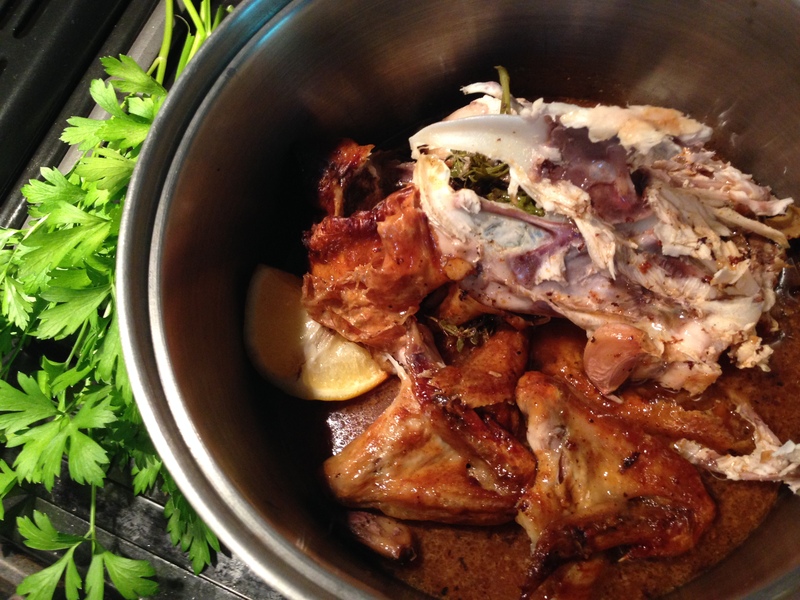 If your roasted bird had herbs etc in the cavity, feel free to leave them in. If you are using a bought chicken that came with stuffing, remove any stuffing first! Add a cup of boiling water into your baking pan, and use a wooden spoon or scraper to loosen all the caramelised goodness and juices from the bottom of the pan. 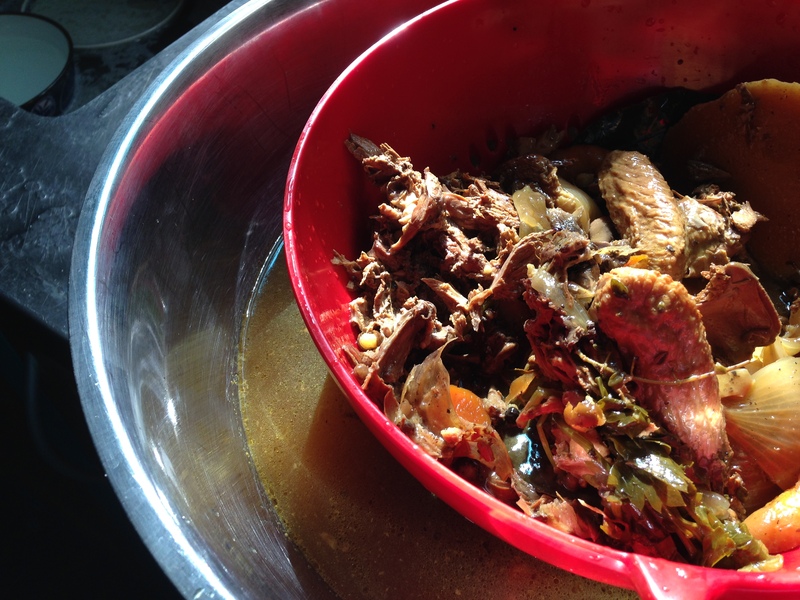 Tip that delicious mixture into your stock pot. Now roughly chop the vegetables, and add them and the herbs. I also threw in some fresh turmeric root and some sliced ginger, which are both fabulous anti-inflammatory herbs for your immune system. Cover the whole lot with a couple of litres of cold water, so that the chicken and vegetables are well covered. 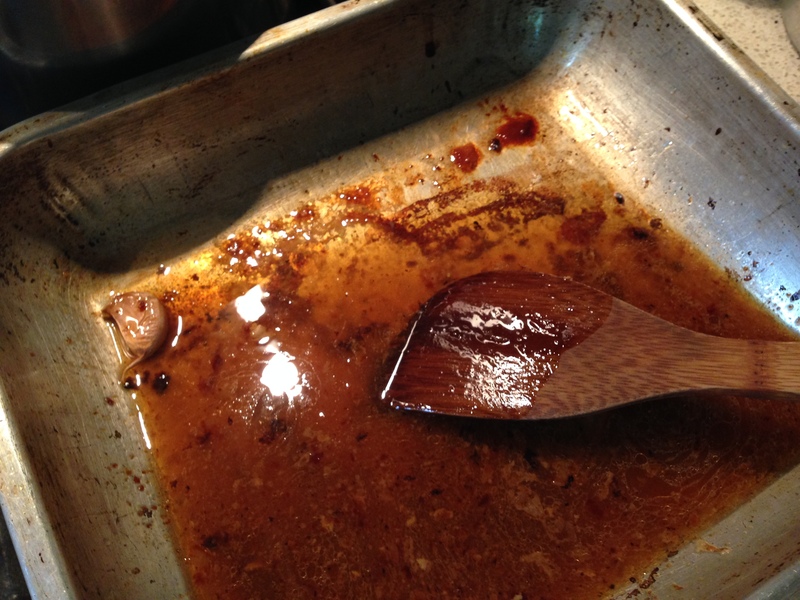 Pop in the tablespoon of vinegar. Bring to a slow boil and then turn the heat right down, put the lid on and let it simmer away. When the broth is finished it should be a rich clear brown colour. Leave to cool and then strain into a bowl and pull any remaining meat and carrots out for your pet’s meals. (No onion for dogs!) Discard the rest. Decant into containers and place in fridge to chill. Spoon off any fat one it has cooled. 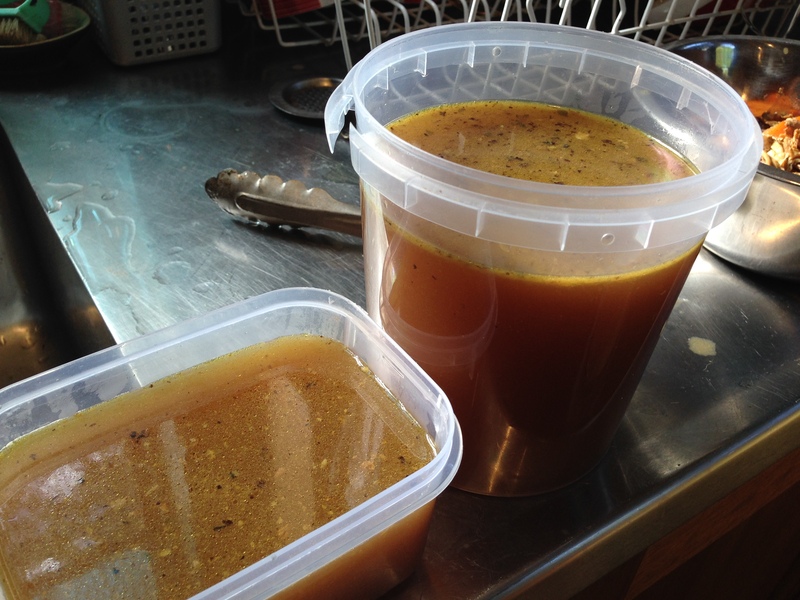 Stock will keep for one week in fridge or three months in freezer. 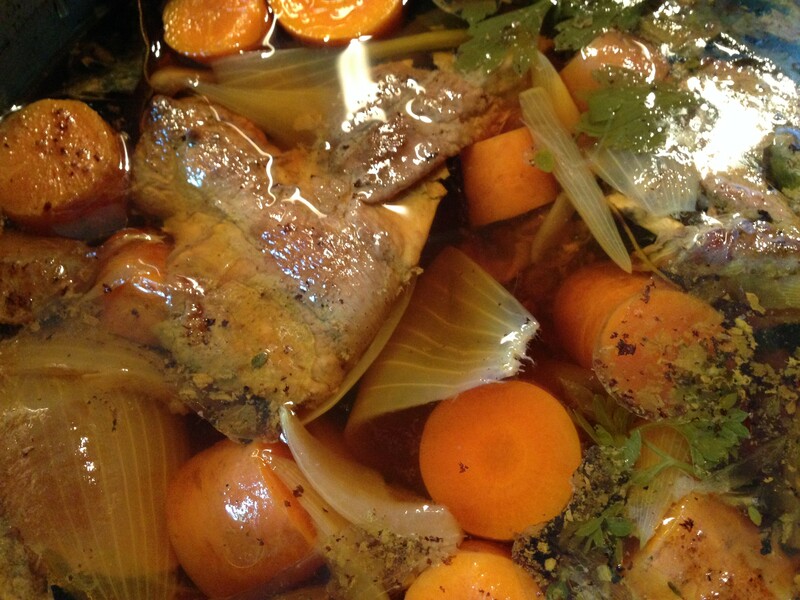 This entry was posted in Invalid Cooking, Slow Food and tagged basic stock recipe, bone broth recipe, chicken recipe, chicken stock from roast chicken, easy chicken stock by Cauldrons and Cupcakes. Bookmark the permalink.